A Quiet Place review: "A film that simply screams from the screen"
Krasinski’s thrillingly realised horror shows the world ending with a bang and a whimper. Tell your friends. The horror genre is a great place to experiment – whether that means employing subliminal imagery (The Exorcist), shooting a film in a (seemingly) single take (The Silent House), or pretending the actors are dead as part of the marketing buzz (The Blair Witch Project). But at the mainstream, Platinum Dunes (Michael Bay’s production company) end of things, there’s a certain laziness, in both form and content – hence the proliferation of remakes and sequels. Based on a spec script by Bryan Woods and Scott Beck, and rewritten by director/star John Krasinski, Platinum Dunes’ latest takes a scenario we’ve seen hundreds of times before – how to survive after the fall of civilisation – and makes it fresh with a superb conceit. Whatever has decimated humanity hunts by sound. To survive, humans must make as little noise as possible. The implications of this are enormous – no talking, no machines, and God help anyone who sneezes. In a pre-credits sequence, we meet a family – dad Lee (Krasinski), mum Evelyn (Emily Blunt) and their kids (Noah Jupe, Millicent Simmonds, and Cade Woodward) – as they raid a deserted supermarket for supplies. It’s Day 81, a subtitle tells us, and fallen traffic lights and missing persons posters quickly fill in the scale, if not the nature, of what’s happened. It’s all a little bit 28 Days Later, until Something Very Bad happens to them. The action begins again on Day 472. The family have settled into domestic harmony of a sort on an abandoned farmstead. The walls are papered with newspapers to muffle any noise, and they eat soft food on cabbage leafs instead of plates. There’s even time for some R&R, as Blunt (now pregnant) and Krasinski dance to music playing through her headphones. It’s cute, but it can’t last, and the sense of looming jeopardy is palpable – particularly as Blunt’s due date nears. We’re not going to spoiler one of the film’s two trump cards. Suffice to say the special effects are extraordinary and sparingly used. 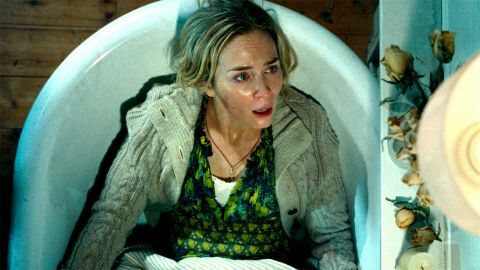 But the main thing that puts A Quiet Place well ahead of the pack is its stunning sound (by Erik Aadahl, Brandon Jones, Michael Barosky and co) and haunting score (by Marco Beltrami). The maudlin piano music is ever so slightly out of tune, like it’s being played live on a piano that only just survived the apocalypse. Cleverly making the most of the quiet-LOUD-quiet-LOUD dynamics of most horror films, the sound is the real star. The silence is eerie, particularly when ‘heard’ from the muted perspective of the character played by Simmonds, who’s actually deaf. When anything disturbs that peace, the soundtrack thunders terrifyingly to life, resulting in a film that simply screams from the screen.